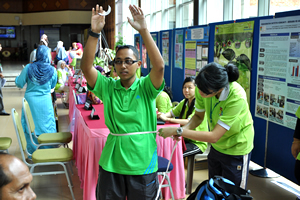 BANGI, 1 Aug 2012 – After losing 15 Kilograms in 4 months Meor Sony Meor Sapelin from the Centre of Information Technology (PTM) was declared The National University of Malaysia (UKM) biggest loser in the Slim Shape programme of the university. 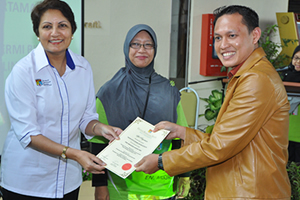 Meor was one of the 97 UKM staff from its Bangi Campus, Faculty of Health and Sciences in Kuala Lumpur and Medical Faculty in Cheras who took part in the programme which ended here recently. 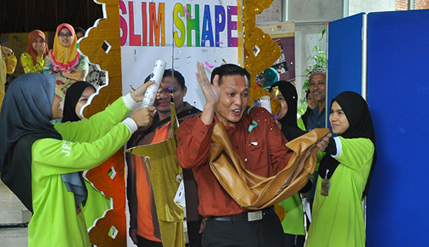 The Slim Shape programme short for Structured Health Activity, Psychology and Eating Program, is to assist UKM staff lose weight while maintaining a healthy lifestyle. The programme which is partly funded by the office of Industry and Community Partnership or HEJIM, used a holistic approach to losing weight. It does not require the participants to starve themselves to shake off their excess weight. By employing calorie counting, portion control of food intake together with an entertaining exercise programme, the participants were able to reduce their weights significantly. 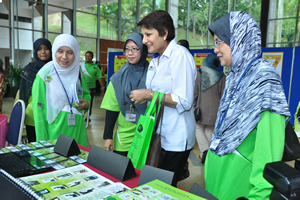 Deputy Vice Chancellor (HEJIM), Prof Dato’ Dr Saran Kaur Gill said the programme could be extended to the community to raise awareness about healthy living. She said the responsibility to protect the health of a family lies in the hands of the people themselves. 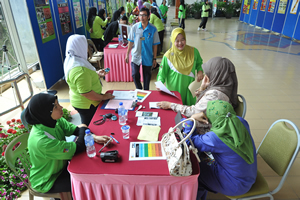 Head of the Programme, Dr Zaharah Abdul Manah said losing weight can be done with proper diet and exercise without having to forgo a person’s favourite food. All that is needed is to reduce the portion and have regular exercises. She do not advise reducing weight by taking health drinks to replace food, as that would reduce calorie intake drastically thereby reducing metabolism which could lead to gaining even more weight when food is reintroduce back into the diet. Present at the closing ceremony was Associate Prof Dr Hidayahtulfathi Othman, Head of Industry and Community Partnership at the Faculty of Health Sciences, participants and UKM Staff.